Q Acoustics' M3 is T3's favourite soundbar, no less. Now it's just dropped the M2, a Sonos Playbase-style 'sound base' as a further audio option for your burgeoning suite of lounge-based tech. T3 has had a listen and it is well up to the standard set by the M3 (and its uglier, yet more 'audiophile' predecessor, the M4). This discreet black box can have TVs up to 25 kilos in weight sat on top of it, or it can live in your TV cabinet, more like a soundbar. 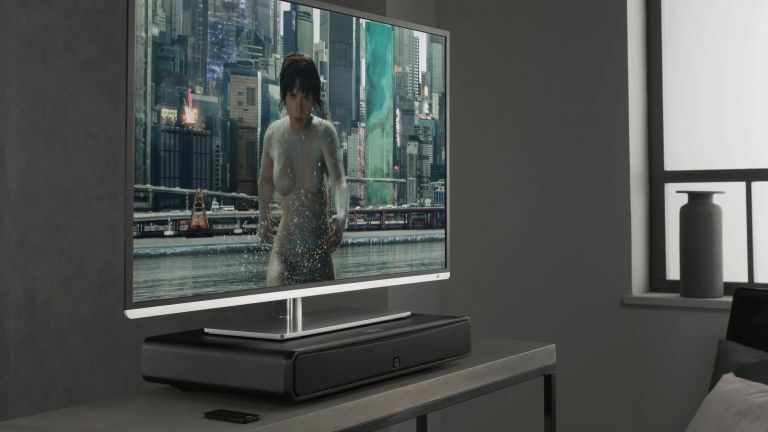 A switch on the back optimises the sound for each position, while a further switch gives a volume boost if your TV's sound output is on the quiet side. The boxier shape also makes it pretty suitable for use as a standalone speaker, not least because, like the M3, the M2's performance with music seems truly exceptional, from what I've heard of it so far. Especially considering it's ostensibly designed for movie sound. Plugged into a telly, the M2 gave a really great rendition of the 'spaceship collision leads to alien vessel scraping along the ground then nearly crushing Charlize Theron' scene from Prometheus. Erm… Spoilers. Sorry. To be honest, with the Balance Mode Radiator speakers giving an impressively wide soundstage, and a down-firing sub providing plentiful but tight bass, I assumed during the demo that the M2 was in the £400-£500 bracket… but it's actually £299. That's not quite 'cheap' as such, but it is a DEAL. Around the back there are two HDMIs, with ARC for super-easy connectivity to just about any telly, as well as optical digital, phono and 3.5mm inputs. Bluetooth 4.0 with Apt-X and AAC allows for high quality audio, the easy and wireless way. T3's early verdict on the M2: dull to look at perhaps, but great to listen to.